Courtesy of Realty Pros LLC. Cowboy Country Lodge on 20 Acres that adjoins BLM. Cascade Views and Extremely Private. 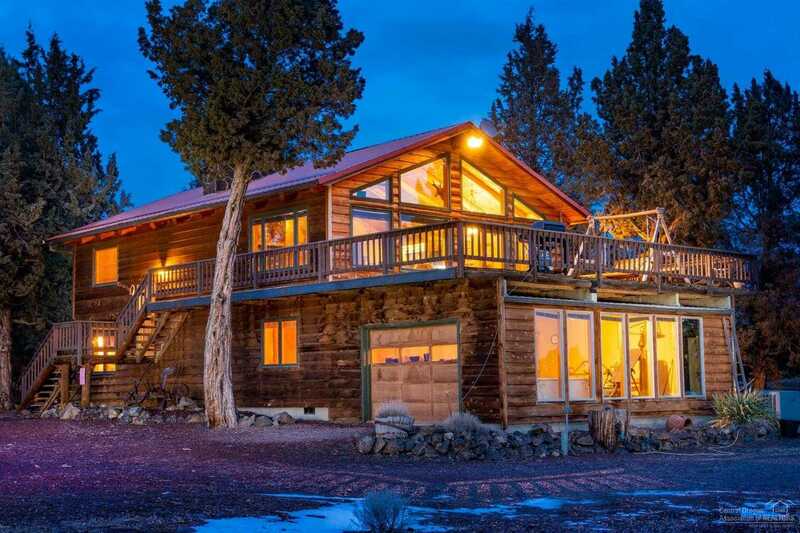 Open Log Beam ceilings, Massive Fireplace & Wall of Windows to enjoy the Expansive Views. Pine Cabinets and Maple HW floor add to the feel. 4 bedrooms, 2.5 baths, Office, Bonus room and Family rooms for spacious living. Multi-level Decks for outdoor entertaining. Beautifully Landscaped with Natural Rock Water Feature. 2016sf Garage/Storage bldg and Guest House. Huge Shop with over 3000sf of enclosed work space, was a Hangar and can be converted back, has an attached 12X76′ lean-to for addl storage. Large hay barn, Chicken coop, Run-In barn & Kennels, various paddocks and an Outdoor Roping/Training Arena. Located on a Dead End road just minutes to Redmond, Sisters or Bend. There is something for everyone at this unique and impressive property. Please, send me more information on this property: MLS# 201900932 – $895,000 – 1440 Nw 87th Street, Redmond, OR 97756. I would like to schedule a private showing for this property: MLS# 201900932 – $895,000 – 1440 Nw 87th Street, Redmond, OR 97756.